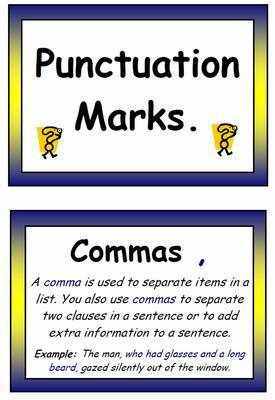 12 posters providing defintions and examples of a range of punctuation. This poster pack includes 12 different posters which provides definitions and examples of full stop, commas, apostrophes, exclamation mark, question mark, hyphen, ellipsis, speech marks, colon, semi colon and brackets. 12 A4 posters that can be stuck to the window, hung across the centre of the room or used to create a display.